John Pell and "Fatte Calfe"
The New Rochelle centennial half dollar was minted exclusively at the Philadelphia Mint. A total of 15,266 coins were produced. ^ "1938 New Rochelle New York Sestercentennial Half Dollar". USCOIN.TIPS - Sinhawk Global Media. Retrieved 30 April 2014. The Isabella quarter or Columbian Exposition quarter was a United States commemorative coin struck in 1893. Congress authorized the piece at the request of the Board of Lady Managers of the World's Columbian Exposition. The quarter depicts the Spanish queen Isabella I of Castile, who sponsored Columbus's voyages to the New World. 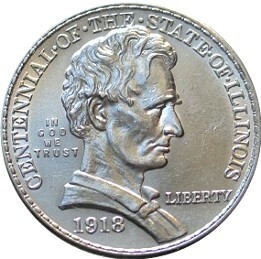 It was designed by Bureau of the Mint Chief Engraver Charles E. Barber, and is the only U.S. commemorative of that denomination that was not intended for circulation. 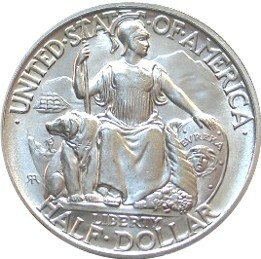 The Huguenot-Walloon half dollar or Huguenot-Walloon Tercentenary half dollar is a commemorative coin issued by the United States Bureau of the Mint in 1924. It marks the 300th anniversary of the voyage of the Nieuw Nederlandt which landed in the New York area in 1624. Many of the passengers were Huguenots from France or Walloons from what is now Belgium; they became early settlers of New York State and the surrounding area. 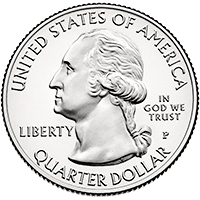 The Hudson, New York, Sesquicentennial half dollar, sometimes called the Hudson Sesquicentennial half dollar, is a commemorative fifty-cent piece struck by the United States Bureau of the Mint in 1935. 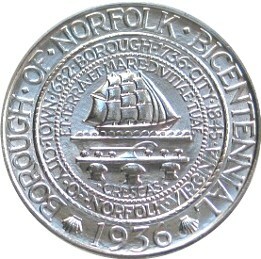 The coin was designed by Chester Beach. 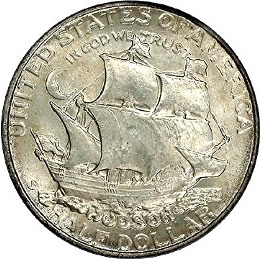 Its obverse depicts the Half Moon, flagship of Henry Hudson, after whom the city of Hudson is named. In addition to showing the ship, the coin displays a version of the Hudson city seal, with Neptune riding a whale, a design that has drawn commentary over the years.